Checkatrade Information for Ideal Window Solutions Ltd.
(When you need work doing around your home, finding reputable tradesmen can be difficult. Can you really trust them? 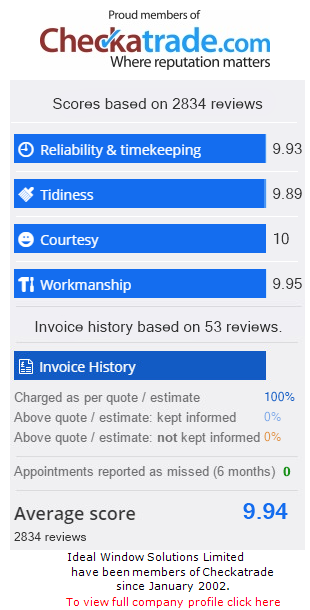 Checkatrade is a free service that gives homeowners the background information they need to make a confident decision when it comes to choosing a tradesmen to undertake their home improvements. Checkatrade offer a directory of trades and services who have been independently vetted to high standards, for example by verifying their insurance, qualifications and professional memberships. Not only that, but they also monitor their work on an ongoing basis by collecting feedback and testimonials directly from their customers. Since 1998 Checkatrade have collected 145,706 customer reports which give you the facts about the strengths and weaknesses of our listed companies. You know what you are getting. Recommendation, reputation, and a standard you can trust. Ideal Window Solutions are proud to have over 2,200 satisfied customers, with an average score of 9.7/10, you can trust us when it comes to professionalism, product quality, customer service and value for money. We have an enviable reputation and you can see from our many happy customers throughout Southampton, Portsmouth, Chichester, Fareham and beyond that Ideal Window Solutions are the perfect choice for your new or replacement double glazing. If you're looking for timber, aluminium or UPVC double or triple glazing for your Hampshire or West Sussex home, look no further than IWS.